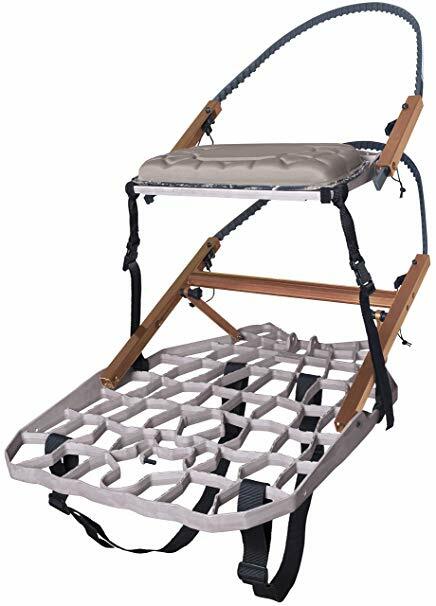 Full featured yet wonderfully lightweight, the Lone Wolf Hand Climber Combo II is the perfect piece of hunting equipment for watching and waiting for your dream buck while being hidden up in the trees. 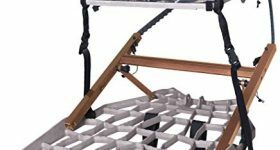 This exceptional climbing tree stand gives you the freedom to go from tree to tree and not simply be tied to a single one in your hunting property. There are several reasons why you should pick this model over others in its class. Sometimes, you may prefer to go after your dream buck on your own and be able to pick a good vantage point apart from your buddies to be able to boast afterwards that you are the best among the rest. This lightweight tree stand empowers you to achieve that with its lightweight and compact 17.5-pound profile. It packs down to a neat 5-inch frame, making it pretty easy to carry in a backpack along with your other hunting gear. You can roam freely to spot the perfect tree without being weighed down by all the gear you have to bring along. Once you have just the tree you want, just unfold the tree stand and start climbing. No hassle, no hefty weight, no problem! Featuring a full-size one-piece 30- by 19.5-inch cast aluminum platform, this tree stand is sure to support the weight of a 350-pound hunter. The unibody construction ensures no weak spots or joints. The platform comes with a smart 3D camo design that renders it virtually undetectable to the target, so you can stay beyond detection while waiting for the perfect opportunity to shoot. The supplied six-point fall arrest system (FAS) has been granted approval by the Treestand Manufacturers Association (TMA), serving as your assurance that the component has a solid enough build to keep you safe. There’s always room to take perfect aim and shoot while standing on the generous capacity platform. You won’t have to do too many adjustments just to position your arms and body the right way when pointing your weapon and taking a good aim on your target. You can move around the large platform with room to spare if you need to take a better position. The contoured seat pad is filled with foam so you can rest comfortably while waiting for the bucks to show up. This means you won’t feel stiff after hours of waiting. The tree stand can be used on tree trunks measuring from 6 inches to 19 inches in diameter, so you can select any tree that you feel will give you maximum advantage for surveying the hunting field. This tree stand comes to you with a bungee strap for hauling your weapons and other gear over from and to the ground. This keeps your hands free while ensuring safe and easy ascent and descent. The included backpack straps enable you to carry the tree stand as easily as carrying essential gear in a backpack. The supplied bow holder holds most parallel limb bows so you can bring along extra gear when needed. The unit utilizes two regular traction belts and can be fitted with longer ones if you desire. The included 6-point Fall Arrest System has undergone testing to ensure that it meets industry standards, so you get enough support and protection as you climb up using the tree stand. The cam belt is quiet and locks on securely so you get good traction on the tree trunk as you go up or down. Get maximum visibility from high up while staying safe in the tree stand, so you get maximum visual advantage while hunting. This tree stand is truly your silent partner that offers safety and portability in one strong package. This portable tree stand enables the modern bowhunter to hunt like a wolf, with its stealthy design plus ease of use that can provide hunters with endless opportunities to make the season’s trophy catch without sacrificing value for the money. This Tree stand is sure to be your trusted hunting companion for many seasons to come.